Phelps, A. & Consalvo, M. (2019) "Development Streaming and Authenticity: Cultural Connections, Democracy and Potential Platforms of Engagement" Media in Transition 10. Boston, MA. Phelps, A., Egert, C. & Consalvo, M. (2019) "Hack, Slash & Backstab: A Post-Mortem of University Game Development at Scale" International Journal of Designs for Learning. Special Issue (April/July, forthcoming). 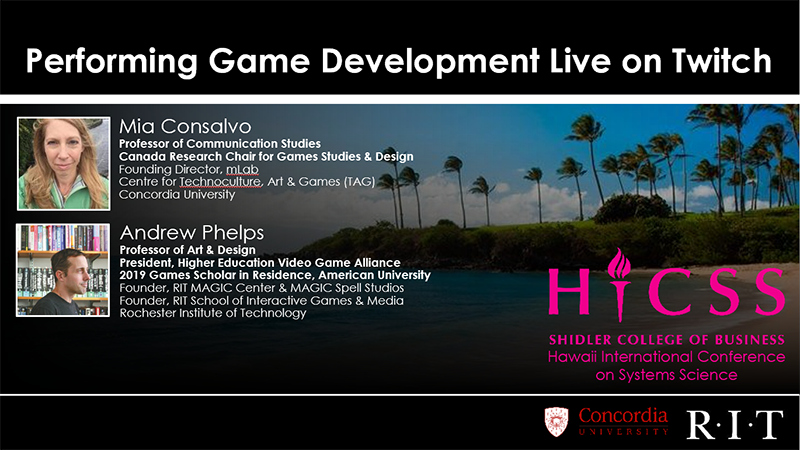 Phelps, A., Consalvo, M., and Egerct, C. Development Streamming as a Pedagogical and Community Strategy for Games Education. 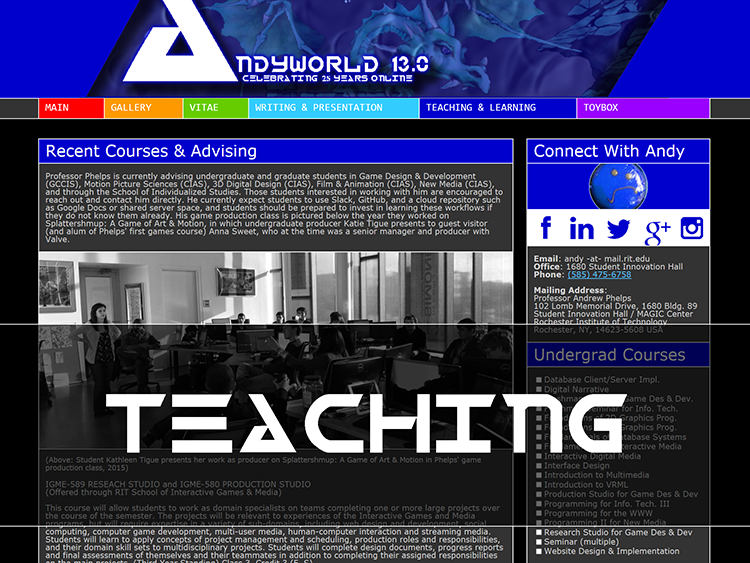 Presented at the Workshop on New Research Perspectives on Game Design & Development Education. CHI PLAY 2018, October 28, 2018, Melbourne, Australia. Decker, A. C. Egert, A. Phelps, “Trial by a Many-Colored Flame: A Multi-disciplinary, Community-Centric Approach to Digital Media and Computing Education”, in New Directions for Computing Education (S. Fee, et al, ed. ), pp. 237-257. Springer International Publishing, Cham, Switzerland. 2017. Decker, A., Phelps, A. and Egert. C.A. (2017) “Disappearing Happy Little Sheep” EdTech: Focus on K-12. 57:2, pp. 50-54. Vullo, R., Phelps, A. and Catalfamo, M. (2016) “DIY VR: The Development of an Inexpensive Headset for Makers” Proceedings of the International Conference on Internet Computing and Internet of Things | ICOMP'16 , pp. 140-44. Decker, A., Egert, C.A., and Phelps, A. (2016) “Splat! er, Shmup? A Postmortem on a Capstone Production Experience”, Proceedings of the 2016 Frontiers in Education Conference, Erie, PA, 9 pages. A more complete listing of writing, publications, articles and periodicles is available in Professor Phelps' vitae and associated materials. 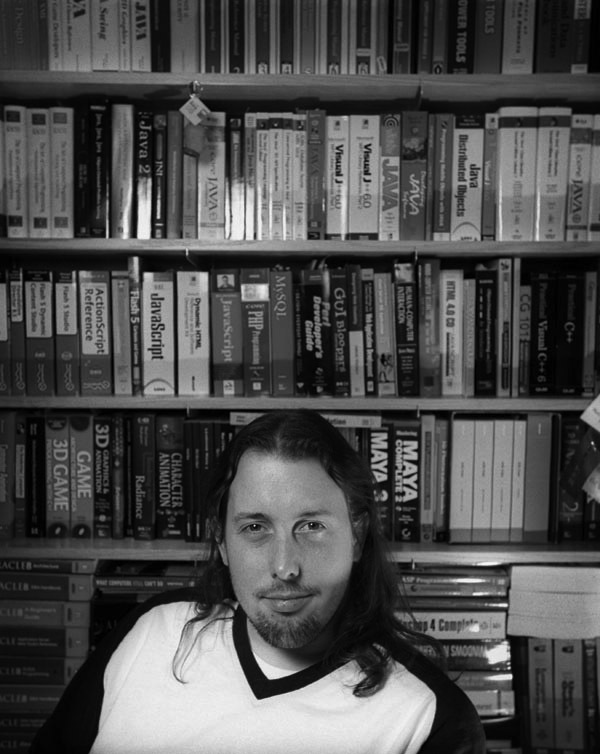 Many of his papers and articles are reproduced in the ACM Digital Library and/or various conference sites and repositories such as the GDC Vault and the Adobe Education Exchange. These are the slides from a presentation at the More Than Just A Games V conference held at the Queen Mary's University of London Centre for Commercial Law. [MS Powerpoint PPTX - 11.1MB] April 2019. 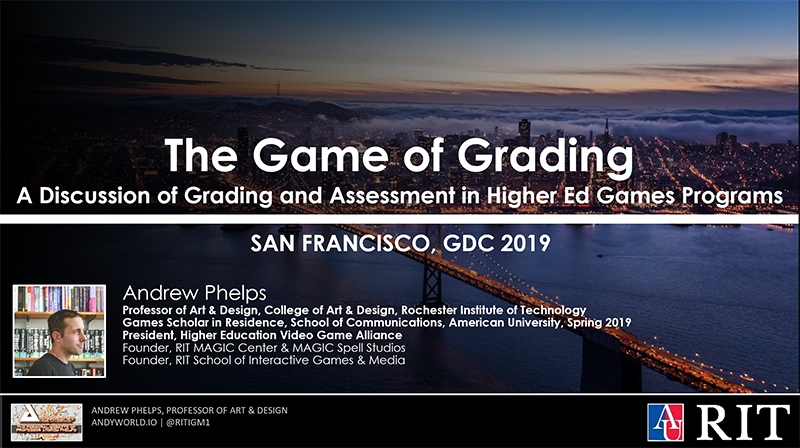 These are the slides from my portion of a panel on "The Game of Grading: A Discussion of Grading and Assessment in Higher Ed Games Programs" held as part of the Education Summit at GDC2019. [MS Powerpoint PPTX - 6.2MB] March 2019. These are the slides from my portion of a panel on "How To Talk About Video Games, Today" (i.e. professional advocacy) at the Game Developer's Conference 2019. You can find more information on the panel, panelsists, and supplementary materieals here. [MS Powerpoint PPTX - 6.1MB] March 2019. 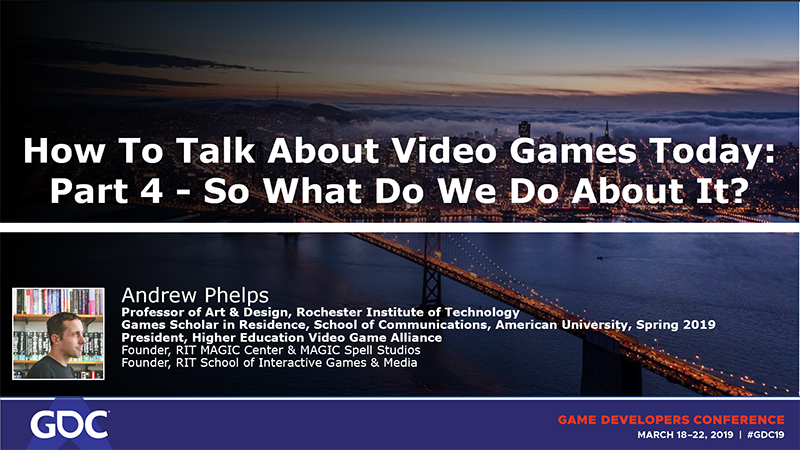 These are the slides from a faculty seminar talk at the American University GameLab, sponsored by the School of Communications in Spring of 2019. [MS Powerpoint PPTX - 280MB (contains video)] March 2019. These are the slides from a presentation at the Texas A&M Department of Visualization.  [MS Powerpoint PPTX - 371MB (contains video)] January 2019. These are the slides from a paper presentation at the Hawaiian International Conference on Systems Science (HICSS). [MS Powerpoint PPTX - 3.1MB] January 2019. These are the slides from a workshop presentation at the University of Utah at the EAE Lecture Series. [MS Powerpoint PPTX - 12.1MB] November 2018. 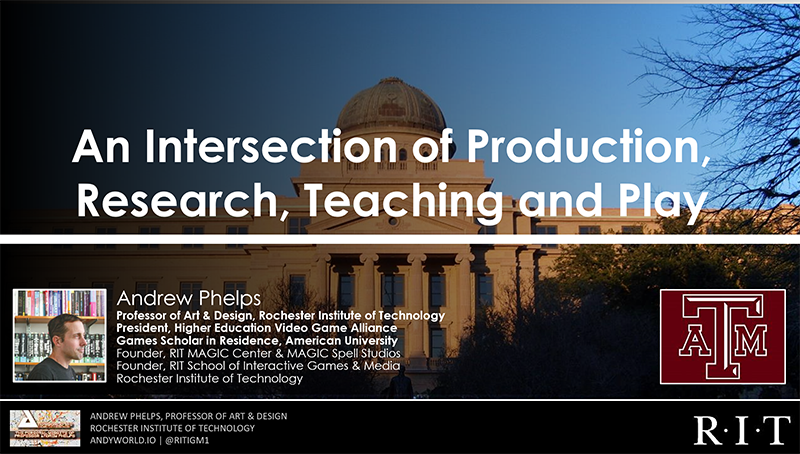 These are the slides from a workshop presentation at the University of Utah as a part of NCA 108 Game Studies Division. [MS Powerpoint PPTX - 2.6MB] November 2018. These are the slides from a workshop presentation at RMIT in Melbourne as a part of CHIPLAY 2018 (Workshop on research futures for game design & development education). [MS Powerpoint PPTX - 6.5MB] October 2018. These are the slides from a talk at the University of California at Irvine as a part of the lecture series at the Bern School of Informatics. [MS Powerpoint PPTX - 13.1MB] October 2018. These are the slides from a talk at Adobe MAX 2018 on game development work and using XD as a UI/UX prototyping tool and ways that could be extended with a research partnership with Adobe (an ongoing effort and collaboration). [MS Powerpoint PPTX - 11.4MB] October 2018. These are the slides from the annual Spinner Lectureship and grand rounds presentation, at the University of Rochester. 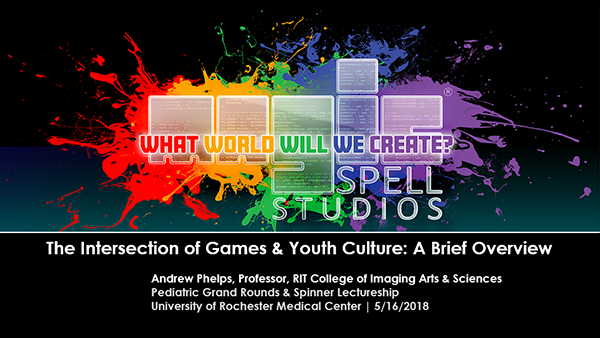 Entitled "An Overview of Games & Youth Culture" this talk was presented to practicing medical staff, residents, and students at the Strong Memorial Hospital and UR Medical Center as the year-end talk. The Spinner Lectureship is an annual talk focusing on pediatrics and health in relation to the arts, in recognition of the late Dr. Elissa Spinner. [MS Powerpoint PPTX - 12.3MB] May 2018. These are the slides from the keynote address at the International Conference on Game Jams and Hackathons, San Francisco. The address focused on the power of the maker community and hacker culture in the face of over-politicized, corporate, and regimented approaches to media development. [MS Powerpoint PPTX - 7.4MB] March 2018. This was the presentation given at the MAGIC Center / MAGIC Spell Studios 5th year anniversary celebration. It was in part a retrospective of all the accomplishments of the first 5 years, and in part setting the stage to the campus for opening the new facility in the coming year. [MS Powerpoint PPTX - 9.3MB] February 2018. These are the slides to a panel presentation at the 2017 Game Developer's Conference entitled "Beyond the BA: Navigating Status as a Department, Center or Program While Working with Industry Partners". Pehlps was joined on the panel by Dr. Roger Altizer, Dr. Jim Whitehead, and Dr. Mia Consalvo. It was the highest rated session in the GDC Education Summit that year. The entire session is available as video in the GDC Vault. [MS Powerpoint PPTX - 11.0MB] March 2017. These are the slides from a presentation on MAGIC at Liberty Hill which is the RIT president's residence. The talk series features campus leaders every month describing their efforts and RIT initiatives to members of the board of trustees, community leaders, local politicians, and faculty and staff from other units across the university. This talk featured substantial discussion on the role of STEM/STEAM education, futuring in the face of automation, and engaging students in entrepreneurial efforts. [MS Powerpoint PPTX - 9.1MB] December 2017. This is a presentation given at the Adobe Education Leaders Education Day at the Adobe MAX 2017 conference, entitled "An Experiential Approach to Digital Media Education". 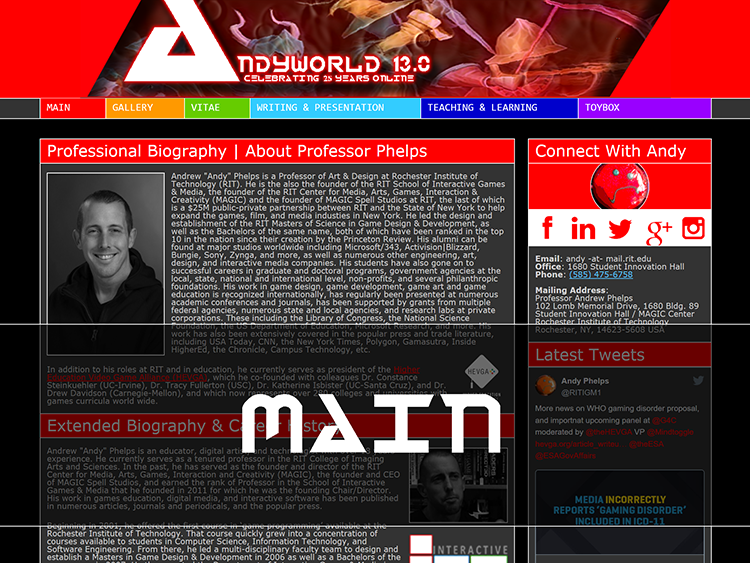 It covered some thoughts on what Phelps was building at MAGIC and why, how it fit with national trends in education, and challenges to the role of education and the arts in today's landscape. [MS Powerpoint PPTX - 20.8MB] October 2017. These are the slides from an in-service talk at the MAGIC Center for Butler/Till, a global creative agency. The workshop focused on the creative process, leadership, management, and various ways to incentivize and encourage creative risk and innovation in a corporate culture. [MS Powerpoint PPTX - 10.9MB] Fall 2016. These are the slides from the Hack, Slash & Backstab Post Mortem Talk. More information, artwork, videos and information on HSB is available in the gallery. The presentation is also available on video via YouTube. [MS Powerpoint PPTX - 35.7MB] Fall 2016. These are the slides from the Splattershmup Post Mortem Talk. More information, artwork, videos and information on Splattershmup is available in the gallery. [MS Powerpoint PPTX - 24.5MB] Fall 2016. 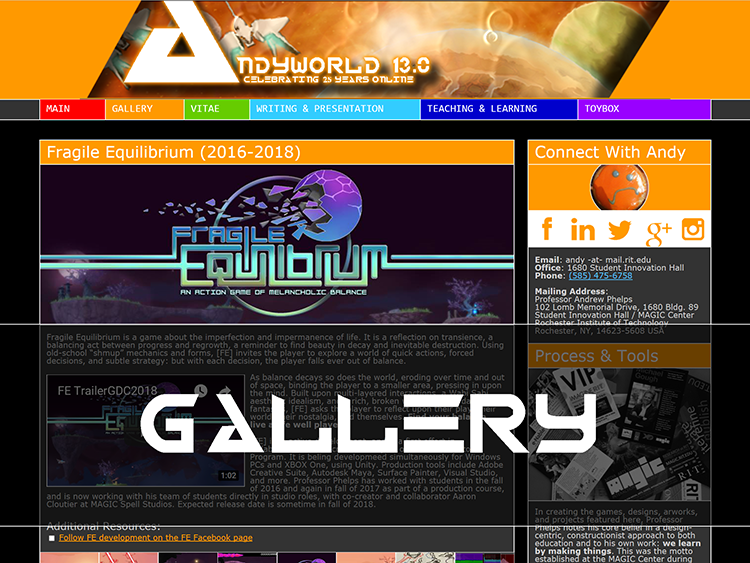 AN EXTENDED ARTIST'S STATEMENT FOR FRAGILE EQUILIBRIUM - A description of the role and purpose of the Fragile Equilibrium game, which is featured in the gallery. WE CAN AND MUST DO BETTER - This is a public essay on the subject of game violence and narrative complexity. This was cited in-audence in further discussion at the Foundation of Digital Games conference in 2017 in Boston, MA. In addition to formal academic publicaiton, Professor Phelps has an extensive history authoring academic whitepapers, policy drafts, proposals, and similar documentation (as well as curriculum proposals and documentation as documented in the teaching & learning area of this site). While such work is generally published for internal audiences, a collection of such is available here that may be useful to other universities and programs, and to illustrate the kind of writing and documentation that Phelps has been heavily engaged with for several years. This is a whitepaper on proposed metrics for tenure and promotion as they relate to games and media faculty. There is significant consternation around this topic in higher education in almost every program, and this has been widely cited and used not just at RIT, but in other programs as well. [PDF - 460K] 2009 / 2012. These are the official guidelines for promotion and tenure for the RIT School of Interactive Games & Media. These were authored by the senior faculty of the department, and Phelps led this process and created the initial drafts along with much of the final language. These were eventually approved and singed by the university president, and accepted as policy by the provost. Since then they have served as a model for several other universities and programs of a similar nature, and also form the basis for a broader set of guidelines within the RIT B. Thomas Golisano College of Computing & Information Sciences which contains departments focused on several disparate fields as they relate to computing generally. [PDF - 1.2M] 2013. 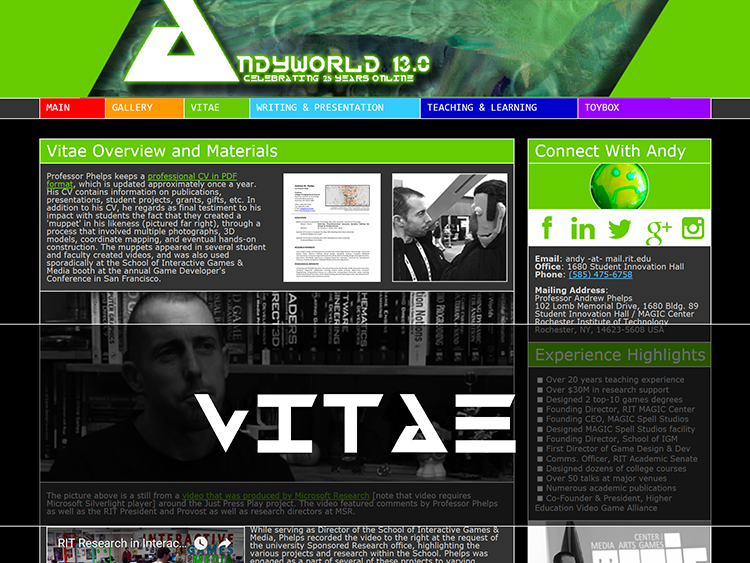 This is an example of a future vision document for the RIT School of Interactive Games & Media. It is also available as an executive summary. During his tenure as Chair/Director of the Department/School, Phelps prepared these every few years for senior leadership to keep them abreast and informed of issues facing the school, the field, and the landscape. This one, entitled "IGM 2010-2025: A Future Vision fo the Department of Interactive Games & Media" was authored in 2010, and projects forward over the next several years. Given it's timeline, it is interesting now to see what has and has not occured since. Of particular emphasis is the discussion of culture and growth as they pertain to program identity. [PDF - 228K] 2010. This is the proposal for the School of Interactive Games & Media, minus any associated financial and human resources data. This was authored collaboratively by Phelps and the group of multi-disciplinary faculty that he led in founding the department in 2009, which later became a school in 2011. It was presented (by Phelps) at the departmental retreat of the Information Technology department in spring of 2008, followed by presentations to the Dean, the Provost, and other associated personnel. [PDF - 533K] 2008. This paper is an outline of how IGM research in games and media is of value and benefit to the later college of computing. It was written expressly for the dean, and prepared by Phelps on behalf of the school. The question of how the new department would integrate with the existing college and culture of computing was of significant import, and this document helped lay that groundwork, as well as the future of minors, electives, and collaborative and multi-disciplinary research around digital media. There are seeds here in what would one day grow into the MAGIC Center. It is presented here as a slightly different form of administrative writing and communication than the policy and proposal work above. [PDF - 247K] 2008. 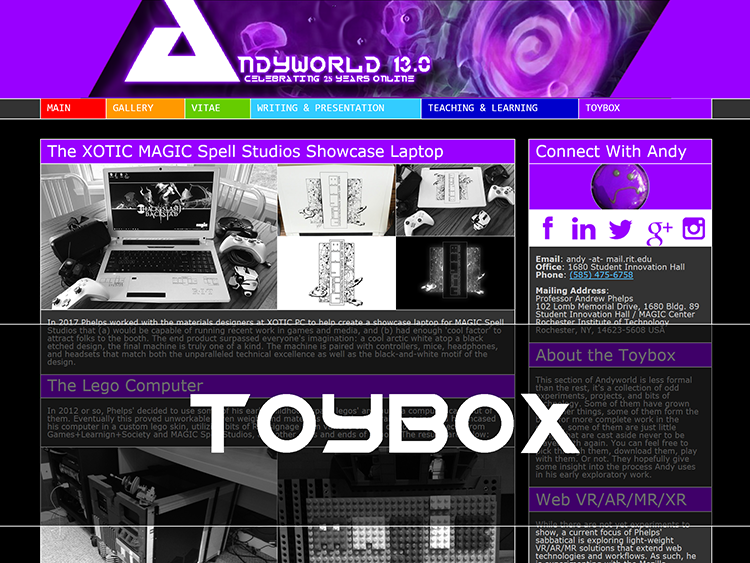 This paper is a whitepaper on best practices for game and media lab design. It was written in collaboration with Microsoft and published extensively by Microsoft Research when XNA was an active product/program. While obviously dated, it is an example of the kind of writing and discourse that more technical facilities construction and design requires - communication between the underlying work with architects, designers, and facilities personnel in collaboration with educators, administrators, lab technicians, and ultimately students and faculty. Co-Authors C. Egert and G. Weber. [PDF - 633K] 2008. "'Cool to see a talk more about the structure of the program rather than specific curriculum issues. This session made the educational summit worth it for me." "Hearing their discussion of the obstacles that they encountered as their programs grew was really useful for me." "Very helpful for me personally. Great to see that other programs have similar issues and complexities." "This level of detailed information about the internal workings of the universities is not easily available. Thanks! Interesting. Good discussions! A strong presentation from a strong panel." Adobe Impact Award in recognition of outstanding contribution to the education community. January 2012. Digital Preservation Award, Digital Preservation Coalition (project nomination) For final report to Library of Congress as part of the Preserving Virtual Worlds research initiative, a collaborative project between Rochester Institute of Technology, University of Illinois, University of Maryland, and Stanford University. XNA Game Studio Express Innovation Award, Microsoft Research. 2006. Best Session Award, Conference for Industry and Education Collaboration, Engineering Technology Division (ETD). American Society for Engineering Education (ASEE).